As a manager and team leader, your success is measured by the success and productivity of your team members. Your ability to inspire, empower, and motivate your team members is critical to their development. Helping your team members reach their potential creates a culture of success and engagement. 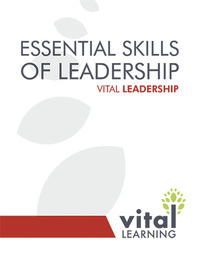 The Vital Learning Essential Skills of Leadership™ course is the preliminary step in developing successful supervisors, team leaders and managers. Essential Skills of Leadership teaches managers and team leaders contemporary techniques for effective leadership, which improves employee performance and increases the productivity of both the team and the organization. Request access to our on-demand train-the-trainer session to explore this course in detail and access a demo copy of the workbook for the course. 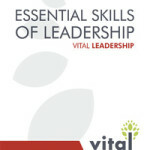 Click the “e” to immediately enroll and begin the Essential Skills of Leadership online course.